In a world where movements, transactions and relations are constantly registered and analysed the access to data is equal to power. This data is in many ways the definition of our identity; We are who we are registered as. 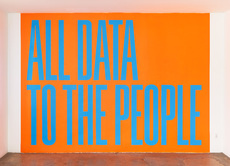 With All Data To The People SUPERFLEX points to this asymmetry in the current access to data or in other words, the right to information and distribution of power we are experiencing.